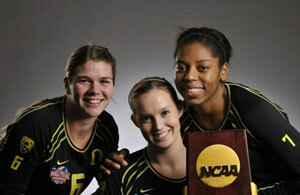 The Ducks Volleyball team is playing for all the marbles. #5 Oregon upset the #1 Penn State Nittany Lions in 4 sets, in the Ducks’ first appearance in the NCAA Volleyball semi-finals. They will be facing #3 Texas in the championship match on Saturday. There was good news and bad news for Oregon at the start of this very tense match. The bad news was that Oregon had come into this match having started slow in the first set of their previous matches, something they weren’t going to be able to get away with against the Nittany Lions. The good news was that the Ducks broke Penn State’s home court win streak last season in Happy Valley, so Oregon did not have any psychology going against them. All they had to do was play solid, and they knew Penn State could be beaten. However, it’s never as easy as that; not against a team that has dominated volleyball the way Penn State has. Oregon was solid defensively in the first set. The digs were there, and there was great effort to keep the ball in play. Oregon fell behind early, though, due primarily to a high number of attack errors. Oregon battled back, and the middle of the set was a back-and-forth affair. 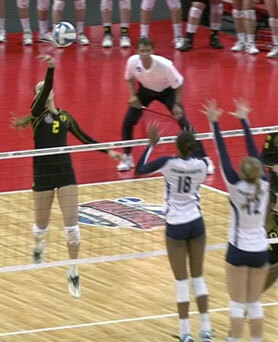 Penn State pulled away with superior blocking and would finish the set with six blocks against zero for Oregon. Blocking turned the tide of the first set, but it did not help that Katherine Fischer had 4 attack errors and Ariana Williams had 3. Those factors combined to spell defeat for the Ducks in the first set, which they dropped 21-25. As they have all tournament, Oregon came out firing all guns in the second set, and pulled away 8-3 in the early going. The Ducks played stellar defense all match and finally settled down, making better attacking decisions. With the score 16-9 it was all Oregon, and Penn State suffered a setback from which they never fully recovered, when their star setter, Micha Hancock, rolled her ankle and favored it for the rest of the match. The Ducks built a ten point lead, but squandered it and allowed Penn St. to get back into the set and tie. Blocks by the Lions tied the set at 24-24, and then the teams engaged in the most intense volleyball play we have seen this season, with Penn St. getting two match point opportunities that they would not be able to convert to a win. 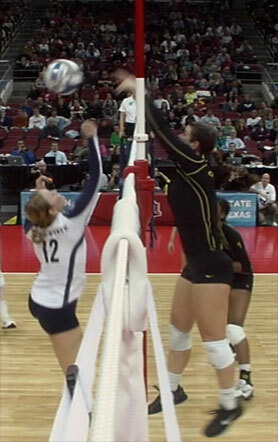 The Ducks pulled ahead, but could not convert a match point. It was impossible to escape the feeling that the Ducks’ entire season would ride on their ability to withstand Penn St.’s comeback. Lose this set and Oregon would be down two sets, and probably out of the match. That would not be the case. Oregon stood tall and converted their next match point, winning the set 30-28. It would prove to be a spirit breaker for Penn State, and buoyed Oregon. In the 3rd set Oregon would falter somewhat, on the strength of the Lions’ blocks, and they fell behind 3-4 before battling to a pair of ties. Then, Oregon pulled away behind the offense of Liz Brenner, who recorded 3 kills that pushed Oregon’s lead, opening the gates for Alaina Bergsma and Katherine Fischer. Fischer recovered from her error-prone play in the first set to play an outstanding third set. Penn State would pull the score even at 19, on the strength of their blocking and on serves to libero Haley Jacob that she was inexplicably failing to put into play. It was not enough to withstand the offense of Brenner and Fischer, though, and Oregon would prevail 25-22. It was in the 4th set that Penn State fell apart. The Lions looked tired and out of sorts, and Oregon charged to a 9-3 lead with an incredible 4 service aces! Penn State would try to battle back as they had done in the second set, but this set would be Oregon’s for the taking. The Ducks would have to go to four match points, but finally prevailed 25-19. Offensively, Ariana Williams and Alaina Bergsma were quieter than usual this match. Brenner and Fisher were the stars, and one could not help but admire Fischer for being able to shake off a horrible first set and be a virtually unstoppable force later in the match. Liz Brenner would end up with 17 kills and 21 points, while Kat Fischer tallied 16 kills and 17 points. Defensively, the Ducks were outstanding, with Bergsma, Brenner, Fischer, and Jacob all recording double-digit digs. The Nittany Lions simply did not match the defensive energy of the Ducks. The Ducks had to have an outstanding game on defense to beat the #1 team in the nation, and everyone stepped up and contributed. And now … it’s time to look ahead. One more match. One more nationally ranked team in Texas, with their Coach of the Year matching wits with the Ducks’ Jim Moore. This one is for all the marbles, and the teams will meet Saturday, Dec 15th, at 4 p.m. PST. All the Ducks have to do is play like they did tonight, pull it together when they are down, as they have all tournament, and … dare we say it? It’s there for the taking. One more match, taking it play by play.